For all the positive things minimalism has done to our decor and recent Netflix bingeing, it’s not without its faulty misinterpretations. For some, it can trigger an inner militant OCD part of us. For others, it means investing a chunk of money for “investment” pieces, making it just another fashion unattainable to the working class. Those ethically-sourced joy-sparking sweaters that match your curated pair of jeans don’t run cheap, you know. The fact is, focusing on finding that perfect multi-functioning sweater for your capsule wardrobe isn’t the essence of minimalism. 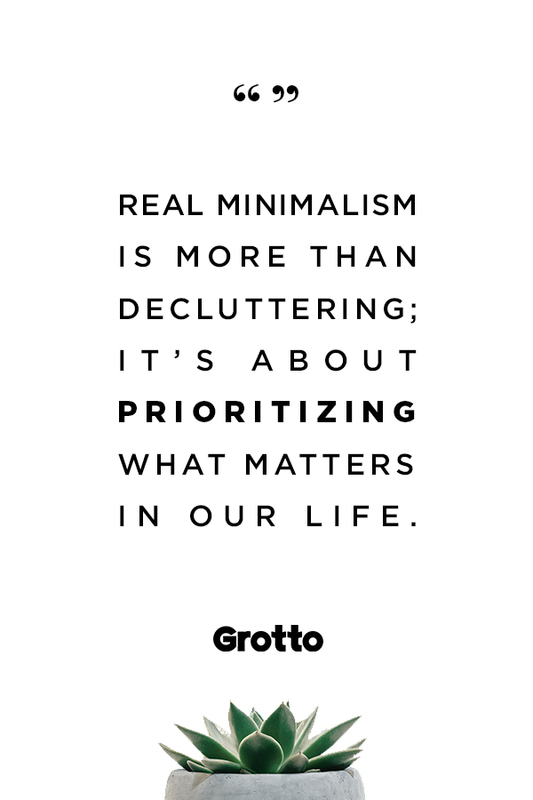 Real minimalism has nothing to do with obtaining things, but rather detaching ourselves from those things. It’s more than decluttering; it’s about prioritizing what matters in our life. Since I shared my struggle to make a minimalist closet three years ago, I’ve learned that there are two versions of minimalism: the aesthetic and the philosophic. The aesthetic minimalist is interested in simplicity as an expression of order. The philosophic minimalist is interested in simplicity as a way to practice detachment from material things and focus our attention on the spirit. While the two definitions cross over and can work beautifully together, it’s paramount that the minimalist philosophy should inform the aesthetic. When the aesthetic leads, it can quickly become just another chase for the next “it” item or look, and the whole point is lost. So, if you’re interested in pursuing a minimalist lifestyle beyond the trend, remember this is what real minimalists do. Real minimalism patiently enjoys the journey (and it needn’t be pricey). Despite what many popular minimalists may tell you, your quest to find minimalism doesn’t have to include a ruthless overhaul to get rid of your things. According to renowned artist and designer Pablo Solomon, who has been in awe of minimalism since the 1950s and 60s, finding the right minimalist aesthetics takes time — the process is practical, meditative, and all about the journey. It’s not instant. Solomon explains that doesn’t mean sitting down and waiting for the right minimalist things to fall from the sky. Instead, it’s about taking your time to curate and enjoying the process. “The delight at finding wonderful elements of design at a price you can easily afford is one of the reinforcing rewards of patience in seeking,” he says. In other words, minimalism doesn’t happen overnight. Ultimately, the aesthetic of minimalism is far more than a neat, tidy appearance. Well-considered and patient minimalism can transform your mindset — if you take the time to be open to it. “The physical example of the balance, proportion, simplicity, and beauty exemplified by minimalism in design can become a lesson in life,” Solomon says. Real minimalism is about detachment. Let’s get one thing straight: things aren’t bad. We need food to eat. Clothes to wear. Places to live. And having preferences for what we eat and what we wear is actually a really good thing. We’re psychological, emotional beings. We need tasty food — it’s better for us! We want clothes that make us look and feel good — it makes us move around the world with confidence! And we certainly want an awesome home in a location that fits our needs (preferably close to a good coffee shop and maybe some shady trees). In fact, it’s been shown that beauty makes us more psychologically healthy — and more productive. After all, don’t beautiful things bring us closer to nature and divinity? The problem is, that in our quest for fulfillment, we can get a little lost. We can get obsessed, and our desire for something greater can lead to an unending desire for something ever more perfect. There’s always something sleeker, more functional, more something. Materialism — whether it’s the old, clichéd Madonna version, or the new minimalistic brand — becomes a problem because it blocks our relationship with others, and ultimately, with God. It makes us blind to what really fulfills us, and perpetuates a cycle of want, and then disappointment, and then more want. A desire for awesome things is completely natural. But when our desires become obsessive — when they feverishly attach us to our things instead of opening us to something greater — we find ourselves in desperate need to refocus on what brings us ultimate joy and balance. Real minimalism is about being intentional with words. Author Mischaela Elkins is careful with the way she talks about her minimalist enthusiasm. “I’ve always tried to toe the line carefully,” she says. “The whole thing smacks of elitism if you go about it the wrong way.” She explains that the best way to talk about minimalism is to simply not talk about things at all (“How minimal!” she jokes). Rather, she talks about her minimalist things only insofar as they are used. It’s about choosing what we say more carefully and making space to listen. When we’re deciding what to say, it might help to ask: Is what we’re saying bringing any value or comfort to people? Or are we just chatting just to hear ourselves talk? When we slow down and choose our words more carefully, it’s easier to understand both the power of our words and their influence on the people we’re with — including ourselves. When we take the time to hear the ongoing narrative that lives within our heads — the words that we tell ourselves, over and over — we’ll have a better understanding of what we really need to detach from, and it could be immaterial things like envy or gossip. Ultimately, real minimalism is far more simple than the Instagram influencers make it seem. It’s a journey to detach ourselves from the materialistic rush and to be intentional about the words we live by, all in order to cultivate the interior dispositions that make us more free and responsive to the relationships that matter in our lives.